Latest Northeast Branch renovations nearly complete! 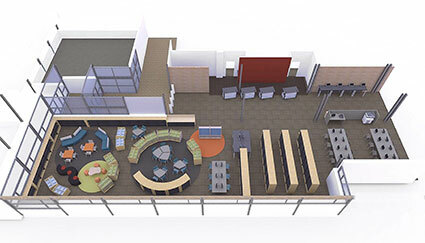 The meeting room of the Northeast Library (6801 35th Avenue NE) still has some children’s area materials stashed in it, but the remainder of our local branch of the Seattle Public Library is nearly done with its recent renovations. Ravenna Blog Intern #2 samples the selection in the newly renovated Children’s Area of the Northeast Branch of the Seattle Public Library. Northeast Branch is very noisy today. #bangbang #drill #renovations I can’t hear anything people say to me. …as well as a new layout: The reference desk area is now where the public computers are located, and all staff service desks and self-checkout area are along the west wall (or the top of the picture below). Bird’s-eye, roof-off view of the renovated portions of the Northeast Branch. 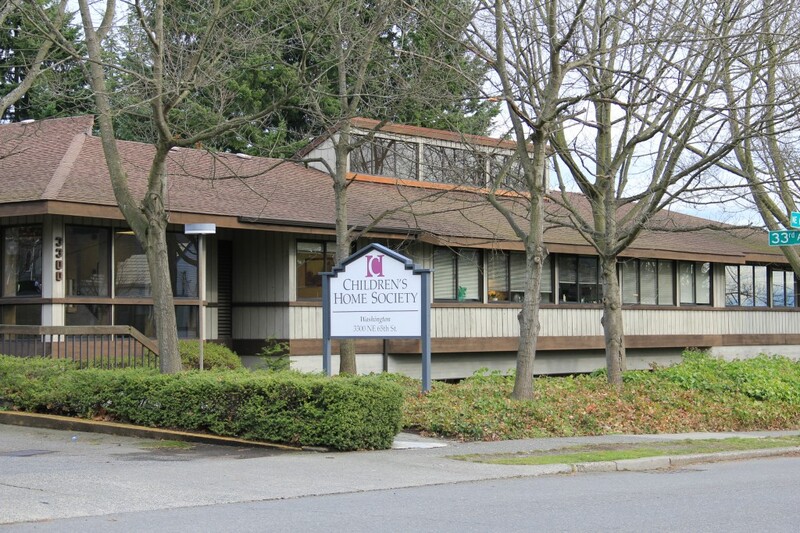 NE 68th Avenue entrance is on the left (click to enlarge). 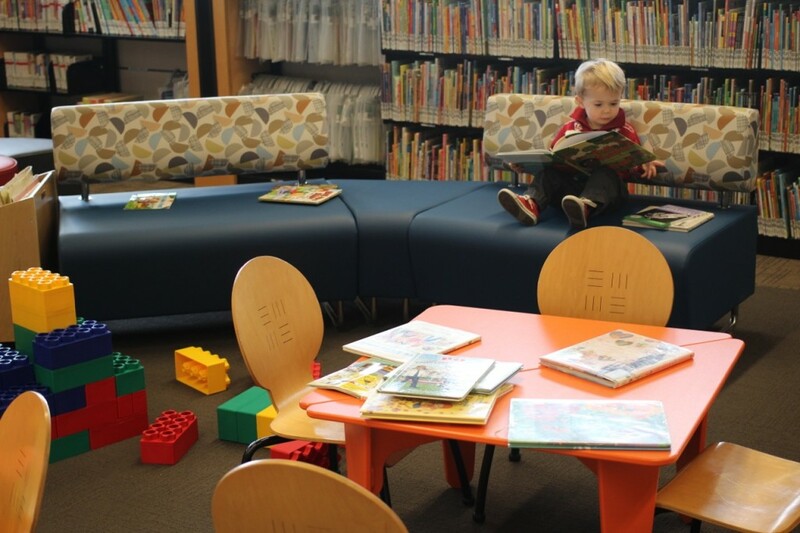 All the new pieces of the Jodi Green and Mike Halperin Children’s Area — seating, tables, even the shelves in the center of the area — are mobile. 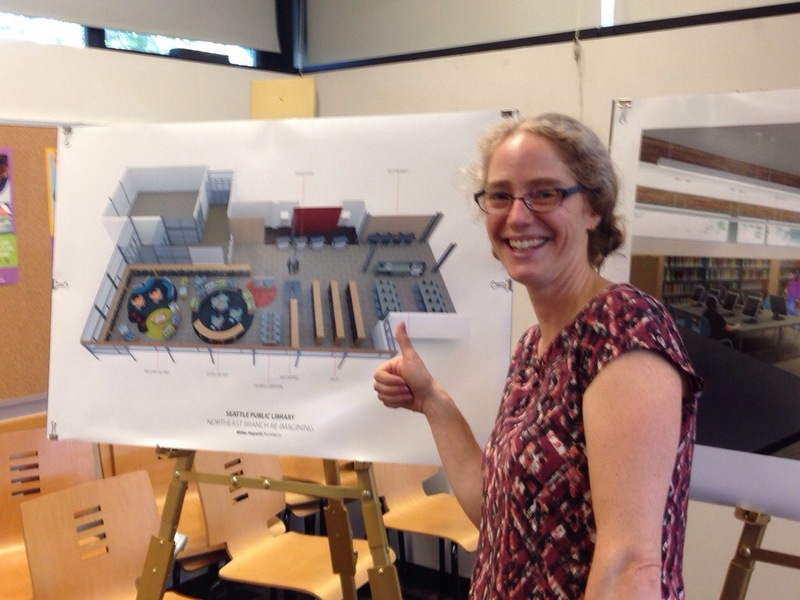 A slightly out-of-focus Delavan at the October 2013 open house gave the plans a thumbs-up. Toddler Story Time (ages 1-3): Thursdays at 10:15 AM and 11:15 AM. Preschool Story Time (ages 3-5): Tuesdays at 10:30 AM. Pajamas and Puppets (all ages): Wednesday, January 29 at 7 PM. 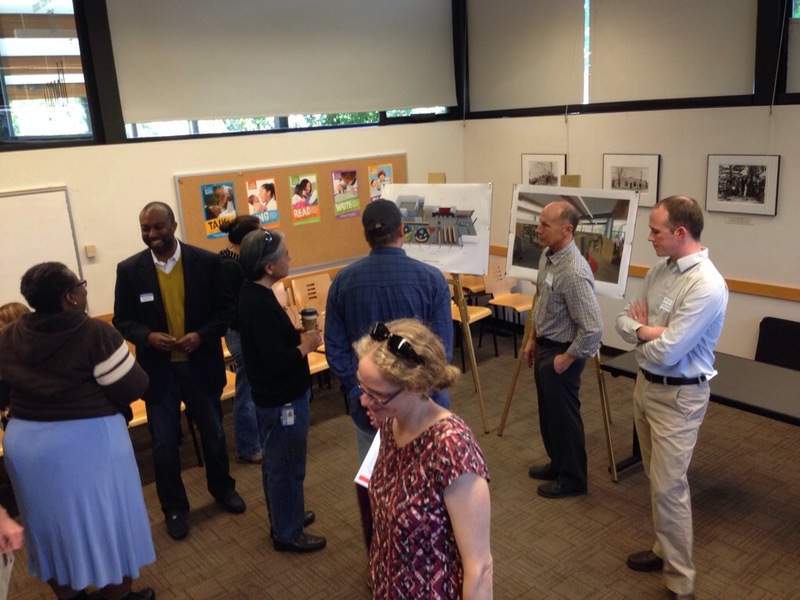 City Librarian Marcellus Turner, Library Board members, representatives from Miller Hayashi Architects, and Children’s Services Librarian Erica Delavan at the open house in October 2013. The Northeast Branch doubled in size after a major expansion in 2004. It was renovated most recently in 2009. Seattle architect Paul Thiry designed the building, which opened June 3, 1954 and was designated a landmark by Seattle’s Landmarks Preservation Board in January 2001. The busiest branch location in the entire Seattle Public Library system? Ours. Busy for patrons, and for construction. An open house to show off another round of improvements for the Northeast Branch is being held on Saturday, October 5, from 2-3:30 PM (brief remarks at 2 PM). Coming soon! A larger children’s area, family-friendly seating, more filtered computers for children and more self-service checkout stations. City Librarian Marcellus Turner, Library Board members and representatives from Miller Hayashi Architects will explain the improvements and answer questions. 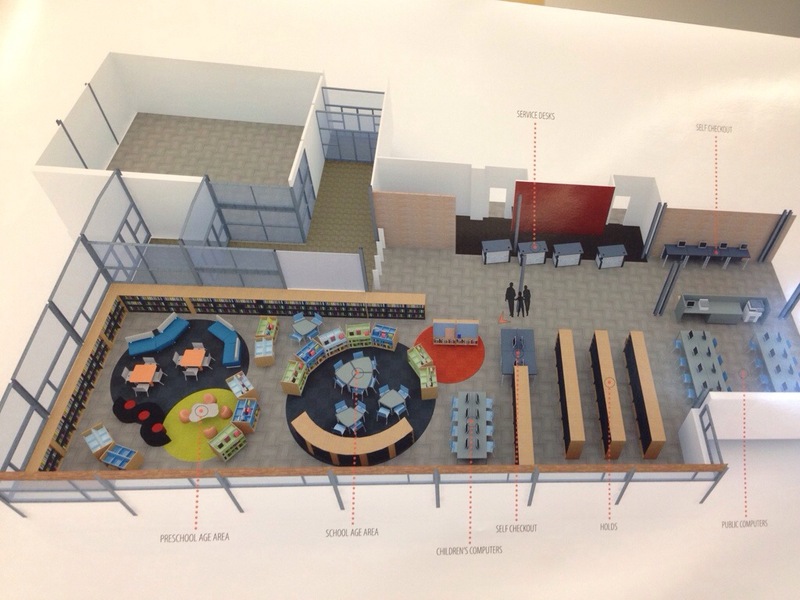 Rendering of the improvements planned for the Northeast Branch (interior SE corner of the building). The Northeast Branch doubled in size after a major expansion in 2004. It was renovated most recently in 2009. If you cannot make it to the open house yourselves, Ravenna Blog is planning on attending. And taking lots of notes and pictures, as is our custom. The Summer Reading Program is in full swing, and we have prizes for all kids from 0 – 12 years old! (Yes, I even have board book prizes for infants, so read to those babies this summer.) Just come to the library to pick up a reading log, keep track of the books your child reads or that you read to your child, and after 10 books, they win a free book! We also have lots of great programs going on this summer for kids, and you can find out about everything here. Thursdays, December 6, 13, 20 at 10:15 & 11:15 a.m.
Tuesdays, December 4, 11, 18 at 10:30 a.m.
Wednesday, December 19 at 7:00 p.m.
Special Guest on December 4! 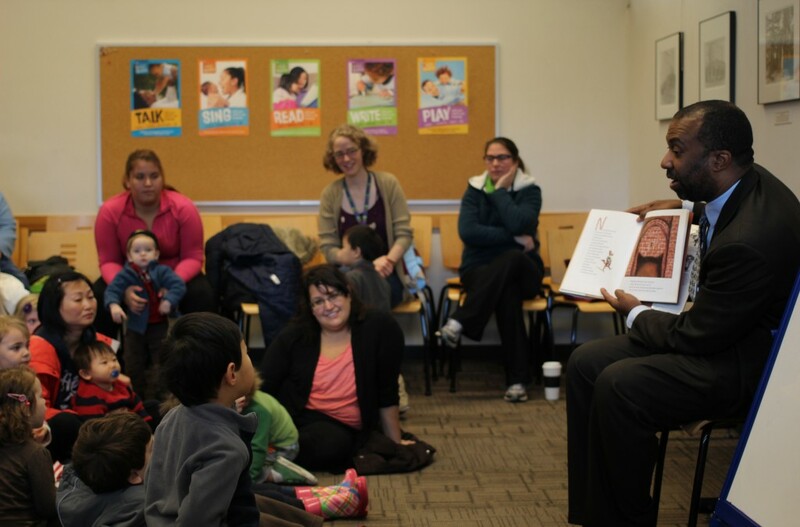 At Preschool Story Time on December 4, we will be joined by City Librarian Marcellus Turner. (We just call him MT.) He is looking forward to reading one of his favorite picture books to everyone! 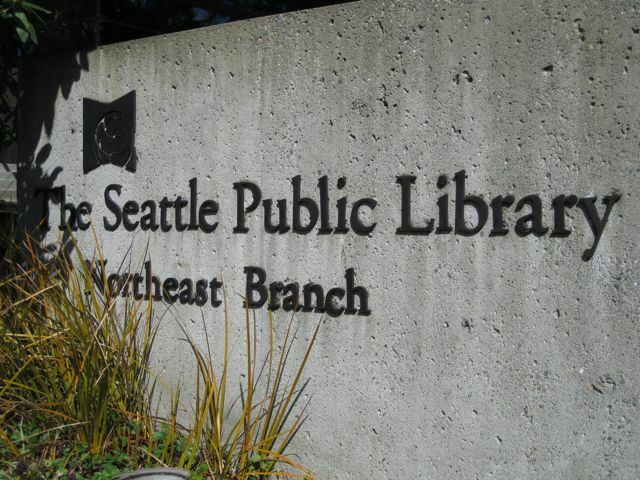 The Seattle Public Library’s Northeast Branch (6801 35th Ave NE) is located one block south of Wedgwood Top Pot Doughnuts (6845 35th Ave NE), an important fact that is not lost on any member of the Ravenna Blog staff. UPDATE (12:19 PM): City Librarian Marcellus Turner read “The True Story of the Three Little Pigs” by Jon Scieszka (illustrated by Lane Smith). If not for our deep and abiding love in this neighborhood (and our slightly fanatical desire to find out what’s happening here), we’d probably writing a blog about our favorite children’s books. Happily, this weekend, both these passions intersect. 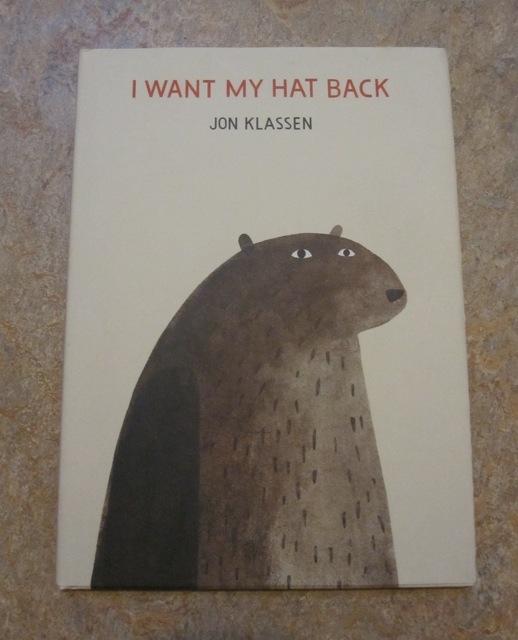 This Sunday, October 14, from 3-4 PM, Jon Klassen will be at the Northeast Branch (6801 35th Avenue Northeast) to talk about his books! Thursdays, July 5, 12, 19 at 10:15 & 11:15 a.m.
Tuesdays, July 3, 10, 17 at 10:30 a.m.
And since we’re on the topic of libraries, did you know that the Northeast Branch started as a humble deposit station at 6259 33rd Ave NE in December of 1945? And that the building at the library’s current location was designed by the primary planner and principal architect of the Seattle World’s Fair? Read all about it (and see some pictures of the older incarnations) at HistoryLink.org (“North East Branch, The Seattle Public Library”). Fellow local site and Seattle Times Local News Partner, the Montlaker, sent us the link to the Pacific Coast Architecture Database listing for Paul Thiry, the aformentioned designer of the Northeast Branch building. Over his lifetime, Thiry designed 55 structures, including the Frye Art Museum, the Washington State Library in Olympia, and, for the World’s Fair, the Washington State Coliseum (now Key Arena). Enjoy Story Time this week in your PJs, or with seeds, or both! Story Times at the Northeast Library (6801 35th Ave NE) are back on their regular weekday schedule the first week of May, but there is a Pajamas and Puppets this Wednesday, April 25, from 7-7:30 PM. 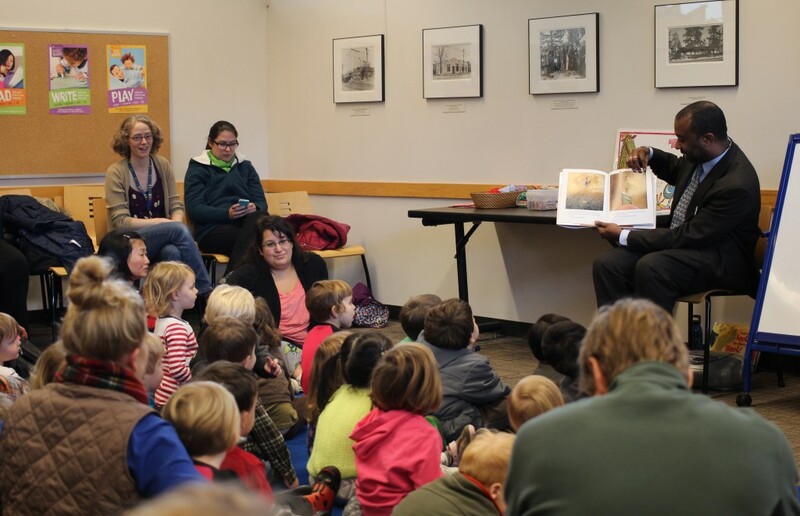 And if you’re looking for a weekend story time to take your sprout(s) to, you may want to check out the Miller Library at the University of Washington Botanic Gardens (3501 NE 41st St) this Saturday, April 28. The library holds a monthly story time with activities for kids age 3-8 years and their families. The program runs from 10:30-11:15 AM. This is a story program that starts small and grows into something amazing! Before the stories, join us in the program room to make a seed mosaic. 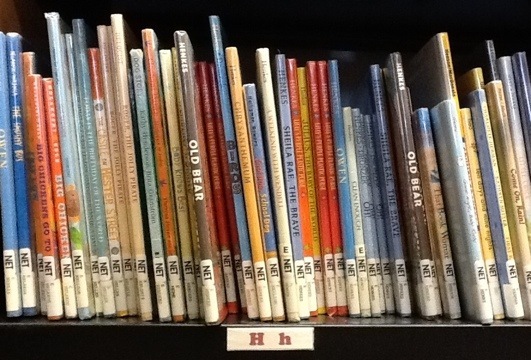 Information on upcoming Story Times at the Miller Library can be found here. Thursdays, March 1, 8, 22, 29 at 10:15 & 11:15 a.m.
Tuesdays, March 6, 20, 27 at 10:30 a.m.
Wednesday, March 21 at 7:00 p.m.
Thursdays, February 2, 9 at 10:15 & 11:15 a.m.
Tuesdays, February 7, 28 at 10:30 a.m.
Wednesday, February 15 at 7:00 p.m. The Northeast Branch of the Seattle Public Library is located at 6801 35th Avenue NE, the same block as Wedgwood Top Pot Doughnuts (apropos of nothing).